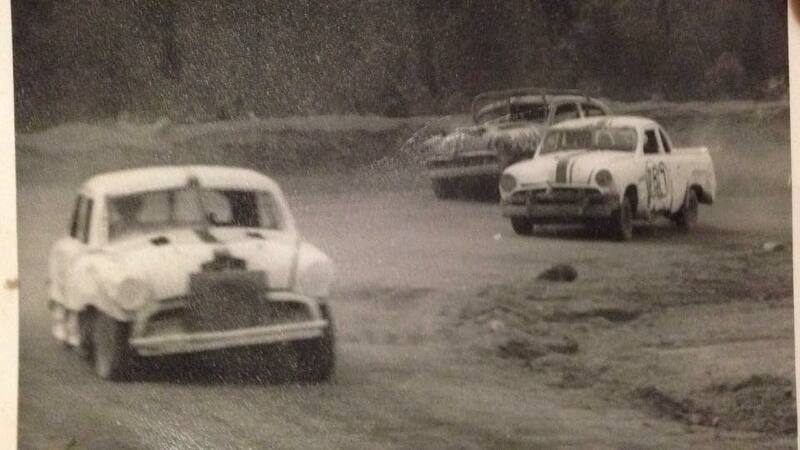 Racing consisted of stripped down pre war cars scrambling through the muddy area's of the river bank. The track was reached by turning left into Bridge Street off South West Highway, crossing the bridge and turning left. The stripped down cars would across the highground of Noneycup Creek on the Egan Park side and down onto the muddy edges of the creek. The Noneycup Creek tracks is situated between Egan Park and The Donnybrook Country Club on Reserve Road, The area is now a Caravan Transit Park. Beelerup Scramble Track was not a mud track, It was built in a sandpit on the top of a hill next to to Donnybrook Flax Mill. Beelerup Scramble Track was situated on the Donnybrook - Boyup Brook road opposite the Cherrydale farm gate, The track was in, what is now the sandpit at the top of the hill. Prior to the building of Cherrydale Raceway another scramble track meeting was held, Utilizing the Trotting Track only one meeting was held. The track location is now a housing development adjacent to the Donnybrook Hospital, no sign of the previous trotting track complex remains. Adam Houston recalls: as a kid and staying in hospital I can remember laying in my bed looking out the window and watching these old hot rods roar around. Cherrydale Raceway was built in the late 1960's by a group of Volunteers known as the Donnybrook Hot Rod Club, The anaugural president of the club was Tom Costello who managed to gain a lot of assistance from the local Rotary Club. Tommy Rudler leads Jim Harris in the Ford Twin Spinner ute with Marty Hall on the outside. Murray Rudler recalls: I had only started primary School when all of this was going, Dad (Tommy Rudler) was working for Trevor Rutley who owned the Boyanup Garage, Dad also used to race hot rods that were owned by Trevor, firstly a Ford single spinner (pictured above) and then a mark 2 Zephyr, Tom Hall who raced mainly customlines and then the ex Richard Hartzer 34 Ford coupe was my uncle and his wife Loila Hall my auntie raced a Ford standard 10 ute. Donny Brook: Dust gave way to mud at the Cherrydale Raceway on Sunday when the Donnybrook Hot Rod Club conducted its first birthday meeting, cars and drivers finished up covered with mud, cold wind and intermintent rain added to the discomfort of onlookers and in the circumstances, a crowd of 100 was concidered quite good. Results: Stock Cars H McVee 23 points, C Hunt 20, T Hawter 20, Cliff Langridge 19, W Mountford 16, N Jeffery 14, M Leach 7, R Glover 5, D Lindsey 4, B Marsh and R Tomerini 2 each. Other results: Hot Rods Richard Hartzer 13 points, B Aramini 12, George Lee 11, A Fry 10, J Bartlett 7, Marty Hall 4, Tom Rudler 2. In all 21 cars took part in the afternoon's programme of which 17 were local, At the inaugural meeting twelve months ago there were only four only. Donny Brook: Like most other youth organisations, the Donnybrook Hot Rod Club is suffering from lack of adult assistance, particularly with the conducting of its race meetings. Club President Tom Costello, says this could mean the differance between success and failure. Speaking to the Donnybrook Rotary Club last Monday night, he said the club was rulfilling a purpose in Donnybrook, it provided an opportunity for young people to drive and race their cars under supervision. Two years ago two boys came to him and asked him to start a hot rod track in Donnybrook. He said he would not concider it unless they could find 20 boys who were interested, Within 24 hours the original two boys were back with the names of 20 boys who wanted to form a hot rod club. That was the beginning of hot rod racing in Donnybrook. With the assistance of the shire council and others a track was developed at the old Cherrydale gravel pit, the track was opened last April, other meeting followed until the Forrestfield accident. It was then agreed that the safety bank at Cherrydale was not as safe as it could be , racing was suspended for about 2 months until the bank and other safety measures were improved, racing has been resumed and is expected to continue until the winter. One of the main aims of the club is road safety, The club is governed by a set of rules drawn up by an association of South West Hot Rod Clubs and disciplinary action is taken against members infringing these rules. When the club was formed about 70% of the members had lost their liciences, since then no member has received a licience suspension. Donnybrook is not a big place and consequently "gates" are not very high, watering is expensive in the summer. This will necessitate the club obtaining one or two small cars of its own, Senior members have to provide their own cars and all their equipment, Junior members would not be expected to do that. Mr Costello said there was only one other adult in the club besides himself, he feels that if he was to go away or pull out the club would collapse for want of direction and supervision. The club was definitely fulfilling a need in providing driver training and an oppportunity for young people to let off steam in safety, all he asked for was some assistance from parents or others. Peter Holder recalls: At the time when I was a young fella growing up in Donnybrook, my farther stressed to me you will get involved in a sport, Well I wasn't into footy or golf so I thought I would give speedway a go, My race car was a FE Holden painted in a Fiat Orange with Green signage, number 22. The FC was built by a local mechanic by the name of Bob Lamb. I enjoyed watching motor racing so I thought it would be great fun to race, This was not totally the case, I raced the car for a couple of seasons with not a lot of success, It ended up on its roof on two occasions and very bent, I always blamed the car, until one day my farther who told me to get out and he put another local driver in the car, That driver went out on the track and flogged everyone in my car, The drivers name was Cliff Langridge. I raced at a few of the other tracks in the immediate area such as Bridgetown, Boyup Brook and Nannup, I have fond memories of mostly Bridgetown, The club and its members were great people and I was chasing around a young bird at the time there to. I firmly believe that with the opening of the new Bunbury Speedway 1972, and the fact that they were paying prizes money, this lured a lot of the top drivers away from the smaller day time tracks, and with that the spectators started to fall away. DONNYBROOK: Hot Rod Club has excavated a 2000 yard dam at their Cherrydale Raceway track so that it can be watered during the summer months. This should do much to eliminate the dust nuisance which troubled both Drivers and Spectators last season. The construction of the dam was one of the club's main achievments during the year. Extensions were also made to the parking area and equipment worth $800 was bought. During the year the Cherrydale Raceway Ladies, a sister orginisation assisted the Hot Rod Club in many ways, but mainly with the catering. The club is now concidering the possibility of including a car rally section within the club. The number of cars in the club has now grown to 23 and more are being built. At a recent annual general meeting,Mr TP. Costello was re-elected President, Other officials are: Vice Presidents B Marsh, C Langridge, Patron R Kenny. Vice Patron E Gibbons. Secretary G Langley, Treasurer P Browne, Social organiser W Feffery, Publicity officer T Rudler, Track Marshall F Downton. Trophies won during the year were presented to the following: Leviston Perpetual sheild for Hot Rods, C Miller, B Stock machines H McVee, A Production W Aramini. Runner's-up for the three main trophies were A Fry, N Jeffery and R Smith. About 300 spectators turned out for the Donnybrook Hot Rod Club's 27 event programme at Cherrydale on Sunday. Good track conditions made for fast times, 35 cars from 6 classes took part,Four of the drivers, Jenny Turnor, V Isseppi, C Miller and A Gardiner escaped unscathed from rollover incidents. The race track is no longer accsesable from the main road, it is quite a long uphill walk to the top of the hill were the race track is. the race track itself is in very good condition and the infield is still fairly clear from regrowth, only a few of the original fence timbers remain on the front straight, many of the infield tyre markers still remain but the spectator and pit area's have been lost to natural regrowth. In 1988 a round of the Prince of the Golden West motorcycle racing series was held on the streets of Donnybrook, The series was held over 6 rounds, firstly Bunbury then Donnybrook then Minengew, Wanneroo, Kalgoorlie and finally Collie. This event would become a sad day for the motorcycle racing community as Eric Nichol would loose his life after crashing his sidecar into trackside bushland.